If you’re planning to visit campus this summer—and we believe you really should—you will want to plan for extra days to check out the region. 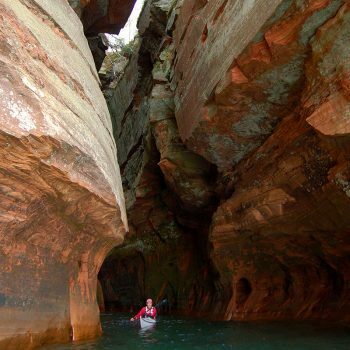 After all, people travel the world to kayak, sail, and hike the Apostle Islands. Here’s our top picks of things to do. Campus is located blocks from Lake Superior, the largest, freshwater lake in the world, and the Apostle Islands National Lakeshore, consisting of 21 islands and shoreline at the northern tip of Wisconsin. You can explore the shoreline or the islands in a variety of ways. Depending on where, how far, and how fast you want to go, choose your mode of transportation—kayak, sailboat, or paddleboard. 5-32 minutes from campus. The Big Top Chautauqua is a canvas tent erected at the bottom of the Mt. Ashwabay—a ski hill in winter and home to the best entertainment in the Midwest in summer—that seats 800 or so. The Big Top brings shows every weekend in summer—a combination of big acts, up-and-coming bands, and house shows. 30 minutes from campus. This region is known for its long stretches of white, sandy beaches. Pack your bathing suit and a picnic and spend sunrise, sunset, or anytime in between at one of the dozen beaches within an hour of campus. Take a sunrise or sunset walk along the lakeshore in Ashland or take one of the many hikes in the region. Here’s two to get you started. Copper Falls is stunning and the walking trail exquisite, plus there’s a great picnic area and historic buildings near the parking lot. The trail winds around and over two bridges, providing different perspectives of the Bad River and its tributary the Tylers Forks flowing through a gorge and over stunning waterfalls. Located 30 miles south of campus, just north of Mellen. This one is off the beaten path. In fact, it’s located down a gravel road with a spare sign to guide but it’s worth the exploration. Located next to Gurney, 30 miles east of campus, there’s hiking trails to the upper falls and the lower falls. In summer, people play in the pools below the falls. But in all seasons, the hike down and up is worth the cardio workout. Houghton Falls has become a rite of passage for students. 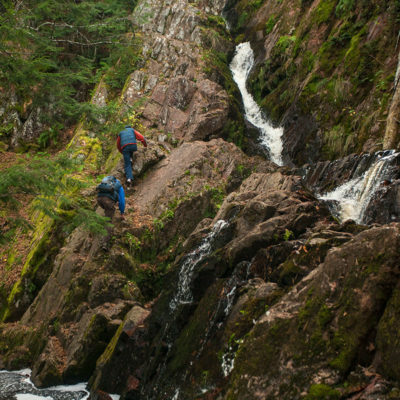 It is a gorgeous, flat, easy hike that follows waterfalls and rock formations all the way to Lake Superior. Take your swim gear—you’ll likely want it. 20 minutes from campus. 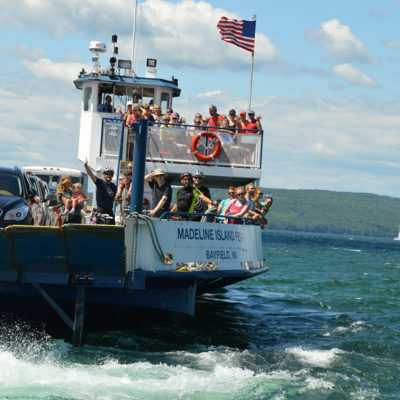 Take a fifteen-minute ferry trip from Bayfield to Madeline Island. If you’re on foot, you can tour the Madeline Island Museum, have a drink at Tom’s Burned Down Café (yes, it’s as interesting as it sounds), eat dinner, and check out the galleries. Or you can bike, hike, swim, and so on. 32 minutes from campus to catch the ferry. This is an experience you will not forget. Take the Apostle Islands Cruises shuttle to Stockton Island for the day (or for more if you’re up for camping and have the time). The shuttle will drop you off in the morning and pick you up at the end of the day. In the meantime, you can hike the Tombolo Trail and play on the beach at Julian Bay, an incredible Caribbean experience in the middle of the coldest freshwater lake in the world. 30 minutes from campus to catch the shuttle. The Second Street Bistro has fresh fish on the menu for lunch and dinner—and they know how make it special. The Snug in Washburn has fresh fish in a true Irish atmosphere. It’s one of the best fish fries in town! Patsy’s Bar and Grill in Washburn offers a classic Wisconsin fish fry with fresh white fish from Bodin’s fisheries. The Fat Radish in Bayfield has fresh fish on the menu and has become a favorite spot for Friday night fish.